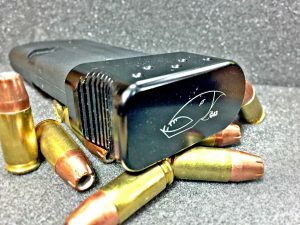 Barracuda Tactical's magazine extensions like this one for the Glock43 are slick and sport the company logo. The struggle is real when trying to balance size and capacity for your everyday carry (EDC) gun. Extended floor plates help add capacity for sub-compacts, and provide some length in the grip for your hand. Barracuda Tactical (BT) is a company that sells magazine extensions for the M&P Shield and Glock handguns. Most are probably familiar with magazine ‘pinky extensions' that lengthen small, sub-compact magazines. Some also increase the magazine capacity by one or two rounds. The products from BT are a bit different. These units are cut from aluminum and are available in a few colors: red, black, blue, or silver. 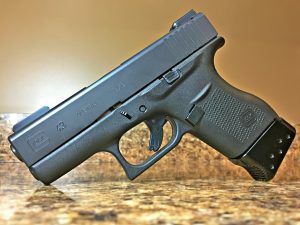 I tested a black, +2 Glock 43 extension and a silver, +2/+3 Glock 27/26 extension. Barracuda Tactical is not alone in the extension market. Hyve Technologies is another top-tier manufacturer with a loyal core following. 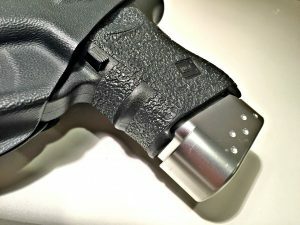 In fact, I have been using a Hyve +2, magazine extension on my Glock 27, for over a year. There are also some cheaper ‘knock-off' companies making similar products, but I have not yet got my hands on any goods for testing. 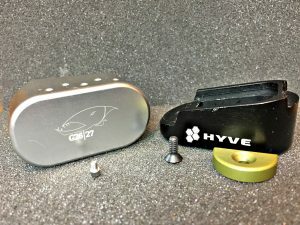 Because I had a first-hand experience with Hyve products, I thought it would be great to reach out to Barracuda Tactical, get some products and see how they compare to Hyve's gear. Barracuda Tactical and Hyve Technologies Glock 27 magazine extensions side by side. The decision to use a magazine extension on your EDC gun is personal. There are benefits and drawbacks of using them, and ultimately you judge if they are something that provides you a benefit. Using a magazine extension has its pros and cons. Added weight and size of these devices can help during magazine changes. On the flip-side, some might not like the added weight. Adding length to the grip can add comfort and stability whenever you're shooting. Yet again, on the other hand, length definitely makes it more difficult to conceal. The added capacity is the biggest benefit in my mind, as every extra round is a plus. Pros and Cons aside, there is a practical argument that people make against adding an extension. The gripe is that putting an extension on a sub-compact defeats the purpose of the small gun. In other words, a Glock 26 with a +3 magazine extension carries less (13 rounds) than a Glock 19 (15 rounds). The extension makes the dimensions of the two nearly the same, and the 19 is easier to shoot … so why not just carry a 19? This argument is reasonable and I see the logic behind it. I will offer this rebuttal, though: People may not have the money to purchase a new handgun, and squeezing a few extra rounds into their existing sub-compact for around $30 is a viable option. Also, some people just like their sub-compacts, and don't want to change. The Glock43 +2 extension has forward serrations that feel great. I can relate, as I have carried a Glock 27 for about 10 years. I am not against upgrading to a Glock 19 or 23, I am sure I could conceal it just as well as my 27. But there is another reason some may not want to merely switch guns. 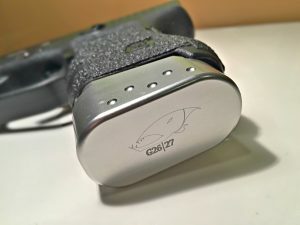 My problem is that I have many custom holsters and products from my 27 that won't work with a new gun. And when it comes to single stacks, like the Glock 43, there is no equivalent that would give you the same capacity, while keeping the same size. So adding a magazine extension is a great idea to increase the diminished single stack capacity. However you look at the rationale for or against their use, this is a huge market and people continue to use them. Whether you're looking at the Hyve or Barracuda Tactical products, you will love the look or hate it. BT's extensions definitely have a different look from the Hyve products. These are a bit sleeker and have a more ‘metallic' look. I like the look of both designs, but I have to say the lines on the Barracuda Tacticals are nice. My bigger concern is how they work. When you add a non-OEM part to your EDC, you absolutely need to ensure it will function. I can attest to the Hyve running well with no issues as I have put hundreds and hundreds of rounds through my gun while using a the Hyve extension. But would these new extensions hold up? The magazine extensions look great, but are they reliable? I wanted to find out. Reliability is paramount, so I put these guys through some rigorous testing, dropping them on concrete and on the ground during magazine changes. You can see some dings and scrapes from the abuse. I found the black color to be more susceptible than the silver to showing scratches. After 200 combined rounds of FMJ and HP through the Glock 43 and 27 with no issues, I felt satisfied. Not a huge round count I know. But I don't feel additional rounds would produce a different result. As you can see, the Glock 43 grip has a serrated pinky groove which was not only comfortable but looked good. The surface of both the Hyve and BT products were similar, but the BT's surface had some dimples, that may be for aesthetics, like ‘bubbles' from the barracuda. But these are also practical as they added some slight surface friction. The barracuda logo on the bottom is a nice touch. Product fit is really important. I had an old Scherer brand extension for my 27 and I didn't like it. The design created a ledge that pinched my finger every time I shot. I never had this issue with the Hyve product. As for the BT extensions, the 43 creates no gap what so ever, but the 27 has a slight gap. Initially, I was worried that I would be plagued by a biting barracuda once I got to the range. But was happy that this wasn't the case and the added grip felt great in hand. The gap between the extension and the frame does not pinch, like some other products I have used. The Hyve products use a ‘magazine stop' that holds the magazine inside the extension, while the BT's use a tiny set screw. Both work just fine, but here is a tip. When installing the tiny screw, make sure to do it where you can't lose it if dropped. My fat fingers almost doomed me as I dropped it into the carpet. With good fortune (and a strong magnet), I was able to find it. Another note on installation: If you are installing these on a Glock magazine, ensure you have a gen4 magazine (the ones with notches cut on both sides of the tube). Neither the Hyve nor the BT extensions will work with a gen3 magazine. The specs of the two are very similar, with the BT being slightly heavier and taller. This chart compares the specs on of the Hyve and Barracuda Tactical +2 Glock 27 magazine extension. Do you use a magazine extension? What is your favorite brand and why? Leave a comment below. So I was able to plug +3 into my g27 mag. It says +2, should I remove the add’l round? Wondering if it will cause problems. Haven’t taken it to the range yet. Thanks. Another reason that you didn’t address is the desire to have a backup magazine with higher capacity. I will carry my G43 with the shorty 6rd in the pistol and have as a spare mag the longer higher cap mag in reserve either in another pocket or pouch. Great point James. Thanks for the feedback. Leave a Reply to James Holmes Click here to cancel reply.